One of the great pleasures of a sunny Sunday in Tokyo is a stroll around Ginza. The main road is closed off and small tables are set in the street. This offers a great spot for an afternoon of people watching after taking in some of the fine shops in this elite district of Tokyo. 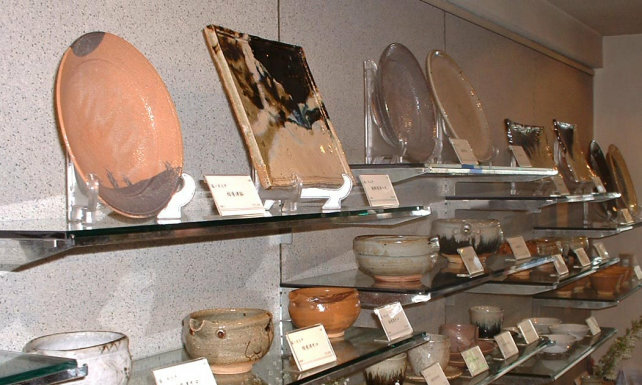 For pottery enthusiasts a stop by the Kuroda Toen Gallery is a must. 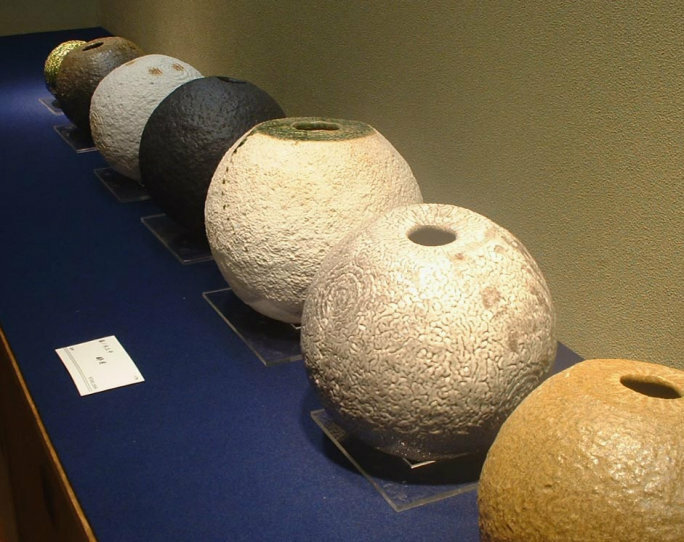 The name Kuroda means "black rice field" and is the family name of one of the most influential ceramic galleries Japan has ever known. 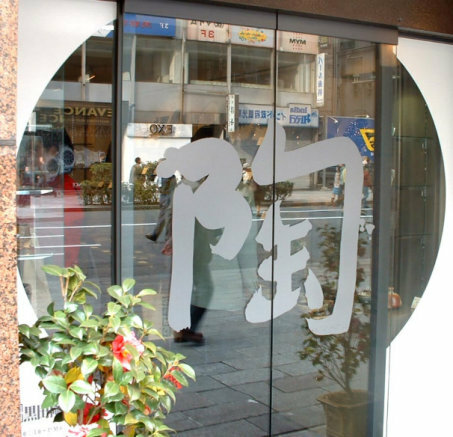 Located at Ginza 7-8-6, it first opened its doors in 1935 under the supervision of the late Kuroda Ryoji. 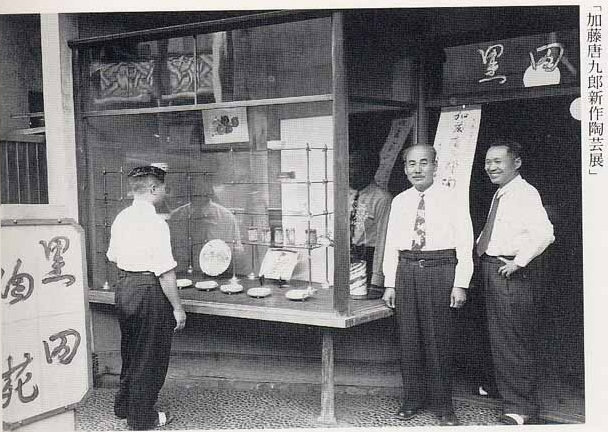 He was responsible for promoting many now famous potters and here is a photo of him and Kato Tokuro in front of the gallery for Kato's exhibition; Kuroda is on the right. In addition to organizing countless exhibitions, Kuroda was also partly responsible for the yakimono boom in the 1960s and 1970s due to his numerous books published by Kogei Shuppan. These include East and West Japan books entitled Gendai no Togei (Contemporary Ceramics), Showa Togei Zukan (Showa Period Ceramic Encylopedia), and Gendai Chato Hyakka-shu (Contemporary Tea Pottery of One Hundred Potters), among others. These books introduced potters from all over Japan to an audience who now had money to spend on the pottery they so loved. The gallery has since been renovated and it has a very art deco feel and quite small and narrow. 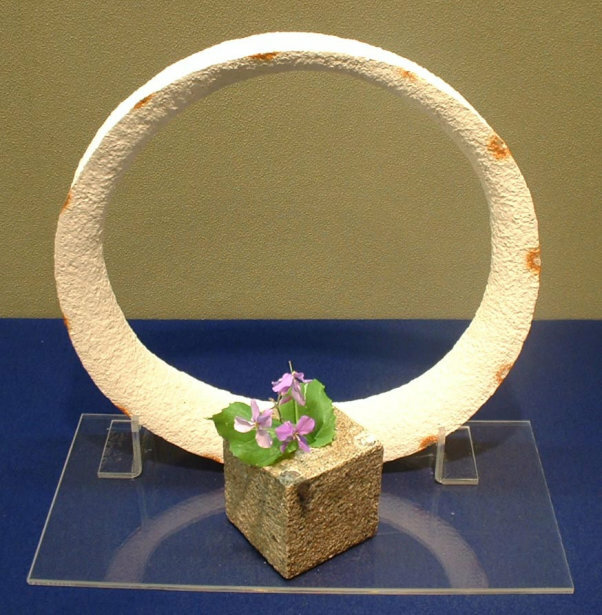 It's now run by Kuroda Kazuya, who is also a prolific author and board member of the Japan Ceramic Society. His running series on chawan offers a detailed and amazing look at many neglected styles and potters, past and present.  A few of the series have been consolidated in the book Chawan Kama-betsu Meikan. Actually, Kazuya is not in the gallery that often and day-to-day operations are managed by his son Yoshio. The entrance to the gallery has the kanji "toh" (ceramics) printed on it quite appropriately. It's hard to miss. If you look up you'll see a large English sign with "Ginza Ceramic Art Since 1935" written on it. The doors open to a narrow aisle with two display areas on either side. There's usually a featured potter's work on display here, or if no one-man exhibition is on, a look at many varied works. 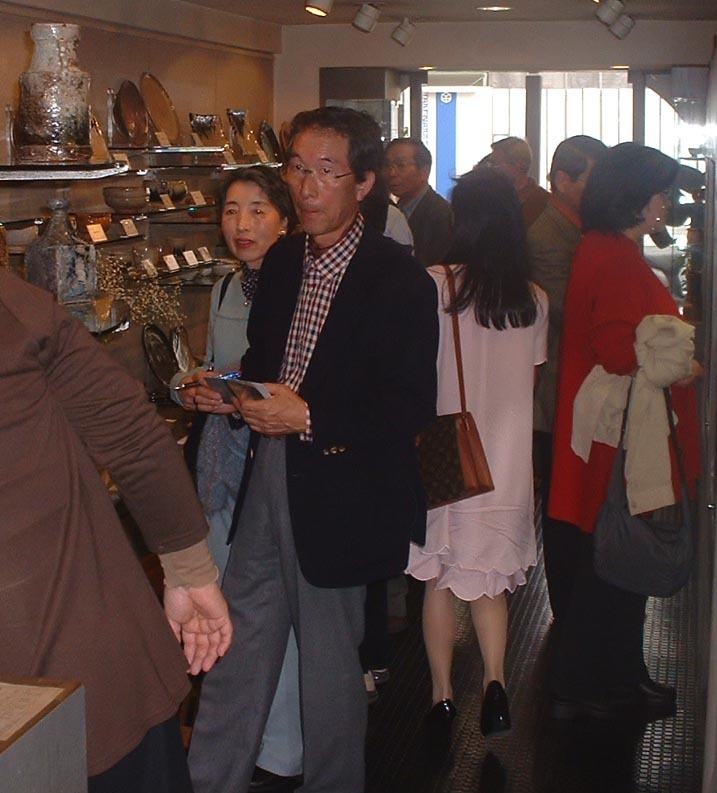 I happened to go on the opening day of a Karatsu potters exhibition so the place was a bit more crowded than usual. 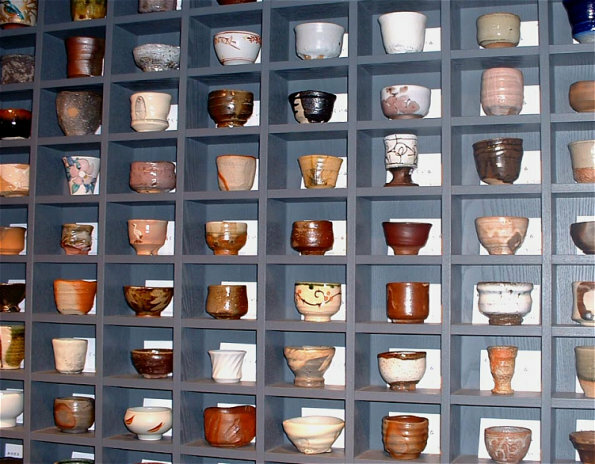 Back behind the counter is a wall of guinomi (sake cups) where dozens of styles are offered. 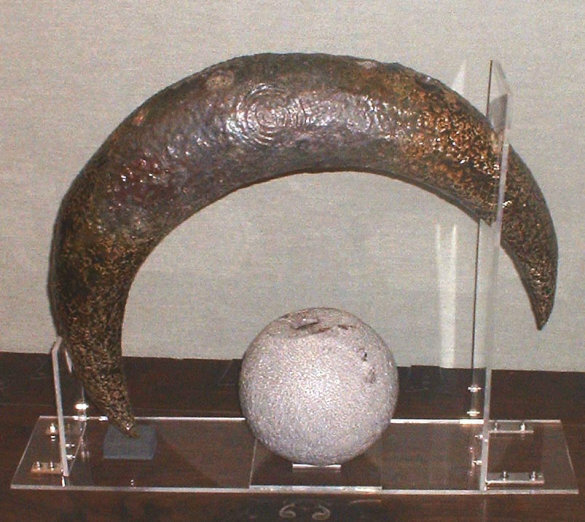 In the glass cases directly behind that is the pricey works of past and current giants; pictured below (L to R) are pieces by Hamada, Kawai, and Fujimoto. 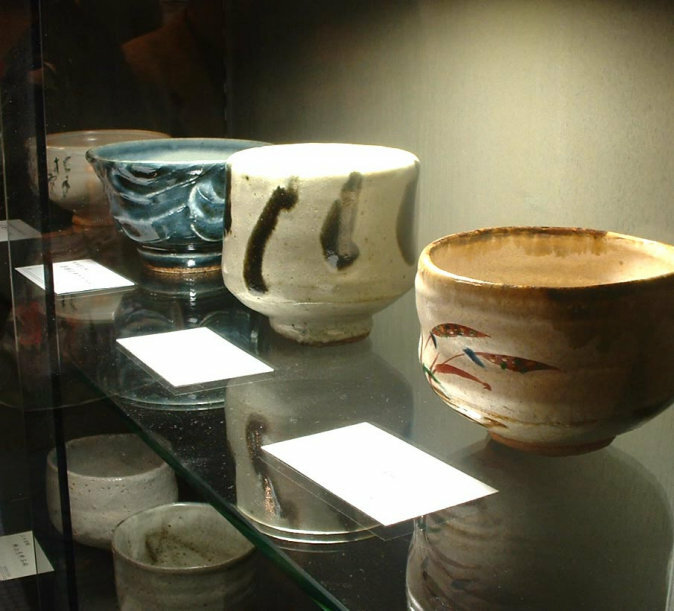 The second floor has another small neat room that shows works of the featured potter(s), in this case the Karatsu potters, or some of the treasures from the Kuroda collection. It is quite an amazing collection at that. I'll never forget the fantastic Okabe Mineo Oribe guinomi that Yoshio showed me once, if only I had the two million yen, or was it three, asking price. Ryoji was a great fan and supporter of Rosanjin so the gallery is also quite strong in his works as well. Well, they have them all now that I think of it; Kato, Arakawa, Yagi, the list goes on and on. There is another Kuroda Toen located in Shibuya which is totally independent from Ginza. It's operated by Kazuya's younger brother Kusaomi and is also a very influential gallery worth the trek to the other side of Tokyo. Click here for a review of Kuroda Toen in Shibuya.